Hawaii allows Sunday sales, but Honolulu Ford has decided to be closed on Sundays. President Mark Benson put up this sign along the H1 freeway near his store. Car dealers hate government regulations, right? In Illinois, Texas and New Jersey, lawmakers who want to allow Sunday sales face vehement opposition from dealers. Sunday sales, dealers argue, are too hard to conduct with banks closed, make hiring and keeping quality workers difficult and are disliked by most consumers. "The hours we work now are long enough that consumers have plenty of time to buy a car during the week," said Bob Muller, general manager of Muller Honda of Gurnee in Gurnee, Ill. "A lot like to come here on Sundays to look and not be bothered by somebody. And it gives salespeople and managers time to spend with their families." 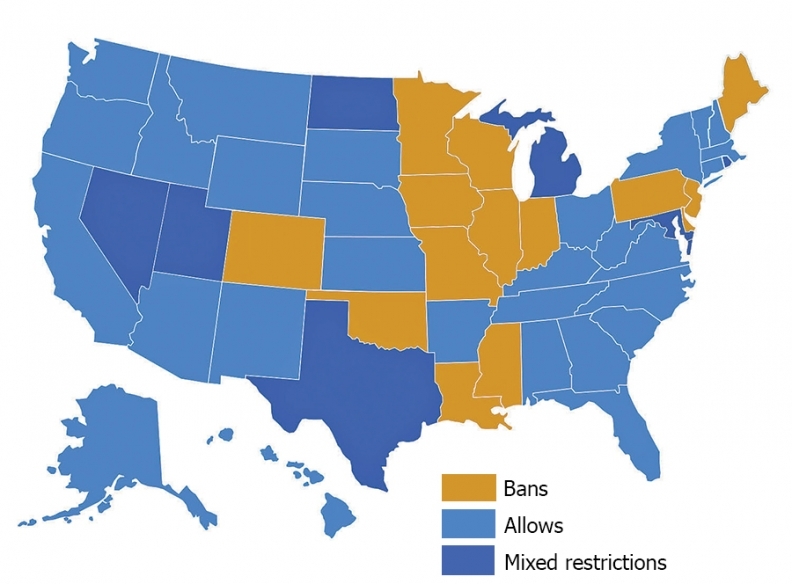 Currently, 18 states ban or restrict Sunday car sales. In those states that allow them, many dealers say they are open that day only because competition demands it. "We'd like to be closed, for the employees," said Loy Todd, president of the Nebraska New Car & Truck Dealers Association in Lincoln. Nebraska allows Sunday sales. About 10 years ago, Nebraska dealers tried to get a law to prohibit them, but "it was controversial," so dealers remain open on Sunday, he said. Bob MullerMuller Honda of Gurnee, Gurnee, Ill.
Utah and Texas: A dealership must not sell cars either Saturday or Sunday. Most choose to close on Sunday. Michigan: The law states if a dealership is located in a county that has a population below 130,000, it can sell cars on Sunday. There is another exception for anyone who observes the Sabbath on a different day. Nevada: There is no statewide ban on Sunday sales except that franchised car dealerships in Clark County do have to close on Sunday. That is a county ordinance, not a state statute, and it does not apply to used-only dealerships. Clark County is north Las Vegas, Las Vegas and Henderson. Rhode Island: Allowed, open from noon to 6 p.m.
Maryland: Allowed in 4 of 26 counties (Montgomery, Charles, Prince George and Howard). North Dakota: Dealers can be open, but no car sales allowed. Therefore most dealerships are closed on Sundays. Illinois has banned Sunday sales since 1983. Dealer Mark Scarpelli remembers life before the ban, when his car-dealer father was never home. "I was 4 or 5. My dad would wake me up to say hello to me because he worked seven days a week," said Scarpelli, president of Raymond Chevrolet-Kia in Antioch, Ill. "I actually thought my uncle was my father. It was kind of a joke." Scarpelli does not want to work seven days a week as his dad did. But Republican state Sen. Jim Oberweis has proposed legislation to lift Illinois' Sunday sales ban. Oberweis is chairman of Oberweis Dairy with stores in Chicago, St. Louis, Indiana and Michigan. As a businessman, he said, he likes the option to be open on a Sunday, as his Chicago stores are. This is the second time he has proposed overturning Illinois' ban. The first time, in 2014, the bill died in committee. If that happens again, Oberweis vows to propose it again next year despite dealer opposition. "It still isn't right that the government is telling a retail establishment whether they can be open or closed," Oberweis said. "If all the dealers don't want to be open on Sunday, fine, that's up to them." But Illinois dealers say that if the state overturns the ban, competition will force all of them to be open on Sunday. Scarpelli and other dealers say they would not gain incremental sales by being open on Sunday but would incur more costs. The legislation awaits a hearing by the state Senate Transportation Committee. Appleton: New Jersey bill to die. In January, New Jersey Sen. Nilsa Cruz-Perez, a Democrat, proposed overturning the ban on Sunday sales. That followed a 2013 proposal from Assemblyman Wayne DeAngelo, also a Democrat, to do the same, which died in committee. "I explained to [Cruz-Perez] that it'll be very bad for business and for the men and women who would have to work Sundays," said Jim Appleton, president of the New Jersey Coalition of Automotive Retailers in Trenton. The bill is in the state Senate Transportation Committee, where Appleton expects it to die. A proposal to eliminate Texas' law is before the Senate Transportation Committee there, said Danny Langfield, deputy executive director of the Texas Independent Automobile Dealers Association in Austin. Texas law requires a dealership be closed either Saturday or Sunday. Most dealers close on Sunday, Langfield said. The last attempt by lawmakers to repeal the Texas law, in 2013, failed. Colorado has banned Sunday sales since 1952, but dealers still fight to protect the ban, said Tim Jackson, CEO of the Colorado Automobile Dealers Association in Denver. The last time Colorado legislators tried to repeal it was in 2005, Jackson said. It failed because the association lobbied hard. That tenacity has earned it a catch phrase, Jackson said. When lawmakers see him in the Capitol corridor, they say: "Hi, Tim. Never on Sunday," Jackson said. "It's like we're branded because we've lobbied so intensely over all these years." Many dealers in Ohio accept the law that permits Sunday sales, said Joe Cannon, vice president of government relations for the Ohio Automobile Dealers Association in Columbus. He said the state "would like us to sell 24/7 if we could" because it relies heavily on sales tax revenue. The law has "worked very well," Cannon said. "It gives dealers the opportunity to choose if they want to be open or not. Many are and many aren't." Some California dealers say selling cars on Sunday is consumer friendly but has its drawbacks. "I don't think we sell more cars per year because of it," said Dave Conant, CEO of the Conant Auto Retail Group in Newport Beach, Calif., which has 11 stores in the state. "If dealers were all closed on the weekend, consumers would find a way to buy the same amount of cars the other five days a week." 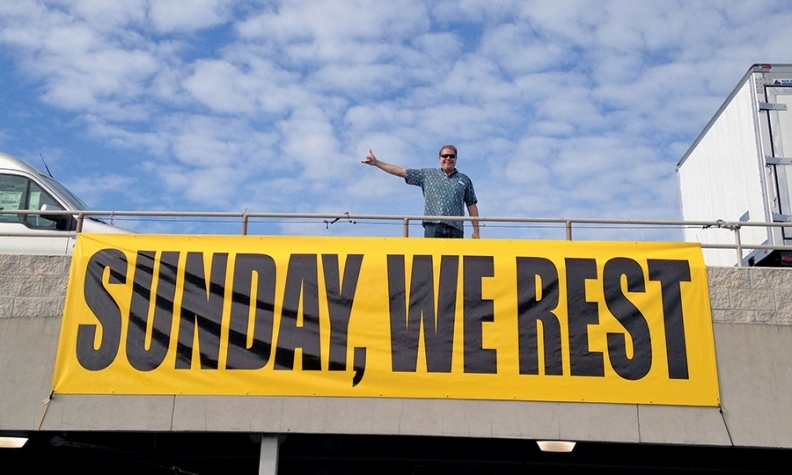 Hawaii allows Sunday sales, but in early 2014, Honolulu Ford President Mark Benson erected a large sign along the H1 freeway near his store that reads: "Sunday, we rest." Many of his competitors are open Sundays. But in the 14 months since Benson has closed every Sunday, he has had less employee turnover and a 25 percent gain in sales vs. the year-earlier period, he said. "We have better-quality, family people working six days a week. They're fresher and rested," said Benson. When people stop in to ask Benson what his sign means, he says, "I look at them and I say, 'What do you think that means?' And they say, 'I think you go to church.' I say, 'You're right. But what else?' They say, 'It means you want your people to have a life.'"